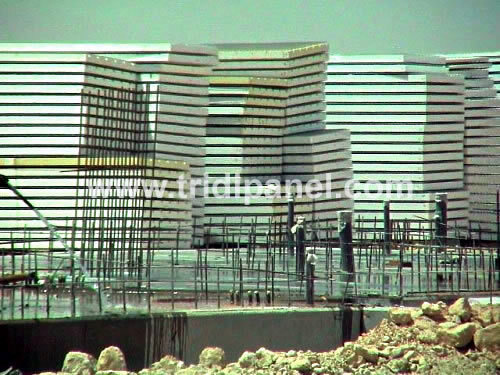 3-D Panels installed multi levels, here three stories. 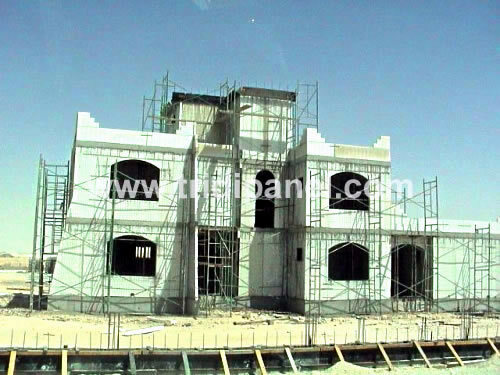 3-D Panels installed, walls, floors and roofs. The panels on this 3-D project where installed one floor at a time, you can see the concrete bond beam connection at each level. 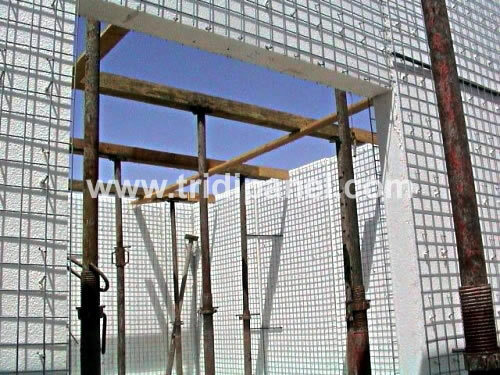 3-D Panel construction, a minimum of 3-D Panels waste or scrape, the panels are cut to the length required or close to it and the panels can be cut in eight inch increments. 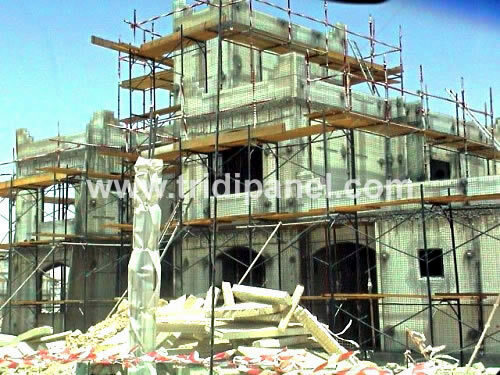 3-D Panel construction, scaffolding is very necessary to build with this system, it is required on the exterior walls and interior walls and ceilings, most contractors or builders over look the need for proper scaffolding. 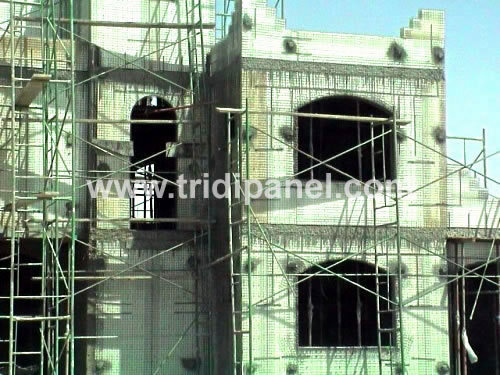 3-D Panel construction. 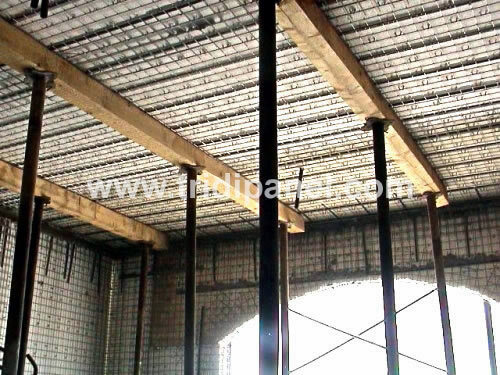 Note: the floor to wall connections, the concrete beams which where created at floors and walls, the 3-D Panels were set n place one floor at a time. 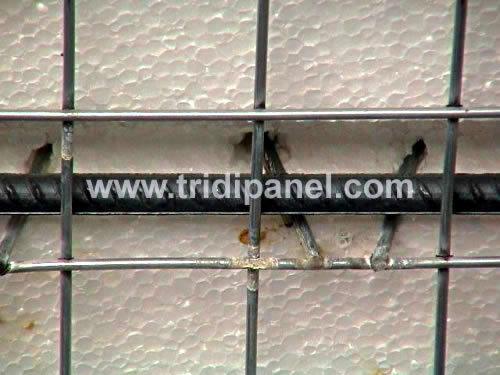 3-D Panel building system, a close view of rebar placed over the 3-D Panel nine gauge welded wire mesh, the nine gauge galvanize wire are welded to each side of the panels two inch by two inch wire mesh, the Portland cement or shotcrete when placed strengthen this welded and we have a structural load bearing wall system. 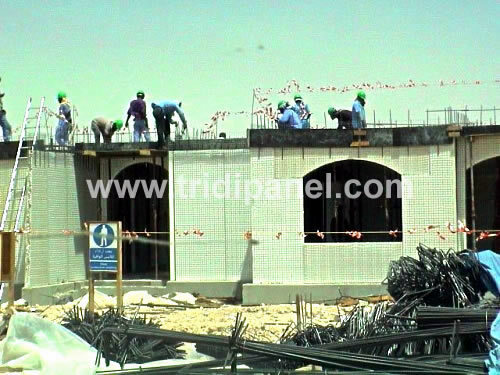 3-D Panel construction, screw jacks and shoring to support the 3-D Panel roof and floors. I sometimes install this after the 3-D Panels have been set in place. 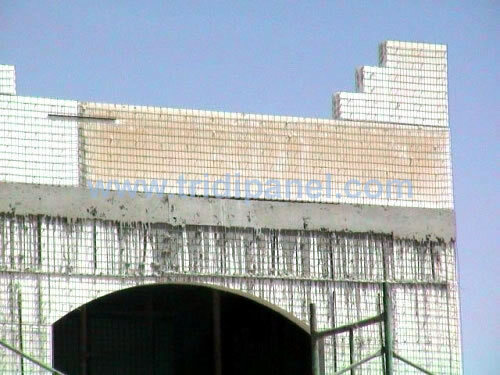 The 3-D Panels will take the span, the shoring is necessary only to hold the panel’s level and straight while applying Portland cement or shotcrete. 3-D Panel wall to floor connection, the void will be filled with concrete; rebar will be installed to receive the upper lever of 3-D Panel walls. 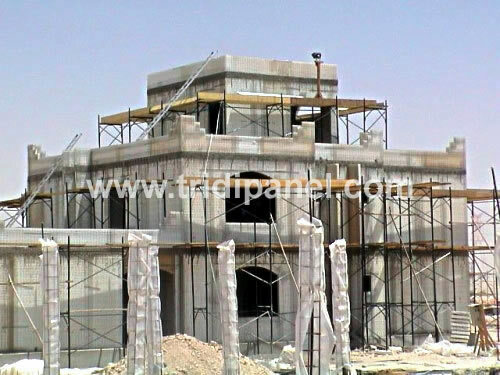 3-D Panel construction, forms have been placed, shoring has been placed under the 3-D Panel floors, concrete will be poured on top of the 3-D Panel floors, the rebar standing straight up will receive the next level of panels. 3-D Panel construction a view of the shoring under the 3-D Panel floor or roof system. 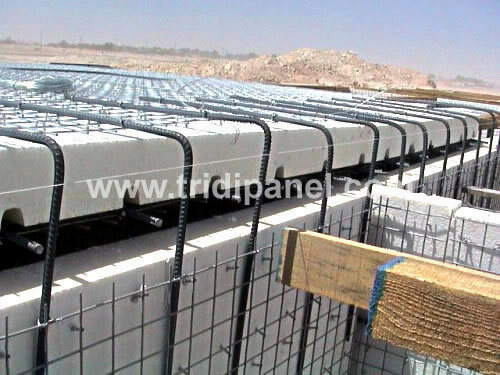 3-D Panel wall system, a close view of floor to wall bond beam.